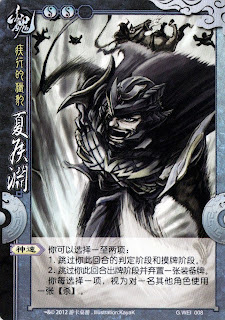 "Lightning-fast Cheetah 疾行的猎豹 (jí xíng dè liè bào)"
Perhaps less famous than his cousin Xiahou Dun 夏侯惇 but a one of the pillars of Cao Cao 曹操's army, Xiahou Yuan was highly praised for his efficiency in logistics. He has been credited as one of the main reasons Cao Cao rebounded from his defeat at the battle of Red Cliffs 赤壁之战 so quickly, thanks to his reliable and prompt logistics handling. In the battlefield, Xia Hou Yuan earned his nickname "Cheetah of the West 西部猎豹" for his lightning fast capture of the cities on the western border of the Wei Kingdom 魏国. Unfortunately, many of these details would have been left out if you had read the simplified version of Romance of Three Kingdoms. The big highlight of Xia Hou Yuan was his death at Han Zhong 汉中 under the hands of Huang Zhong 黄忠. Character ability: "Godspeed 神速 (shén sù)"
1. Skip your judgement phase and drawing phase. 2. Skip your action phase and discard an equipment card. Every time you choose one of these options, it is viewed as you using an ATTACK 杀 on another player. Xia Hou Yuan was known for his speed in moving his troops and catching his opponents off-guard. In his effort to capture the city of Chang Li 长离, Xia Hou Yuan discarded most of his supplies so as to be able to achieve surprise. This is probably the link behind "Godspeed" option 2 ability. In general, Xia Hou Yuan in the cardgame does bring an element of speed since he can choose to ATTACK immediately even before drawing cards. Though this speed is of no consequence whatsoever in terms of dealing damage, it does make him a very useful character since he will always be able to use ATTACK on any player at least once a turn. With option 1, if you have lightning on you do you pass it to the next player or keep the card?